There are two things I don’t like about canning. #1- I don’t like how hot it makes my kitchen. But since building a summer kitchen isn’t on our current to-do list, I can’t do too much about that problem for the time being. #2- Many canning recipes call for boatloads of sugar… For some recipes, like my honey-sweetened Chokecherry Jelly or my Strawberry Freezer Jam, I’ve learned how to use alternate sweetener or special pectin to avoid cups and cups of white sugar. But for the longest time, I avoided canning fruits like peaches or pears because I assumed that you simply had to use loads of sugar to get the job done. Now– sometimes sugar is required in a recipe to ensure that the preservation is done properly and in a safe manner. However, after a little research, I learned that in regards to peaches, this was NOT the case. 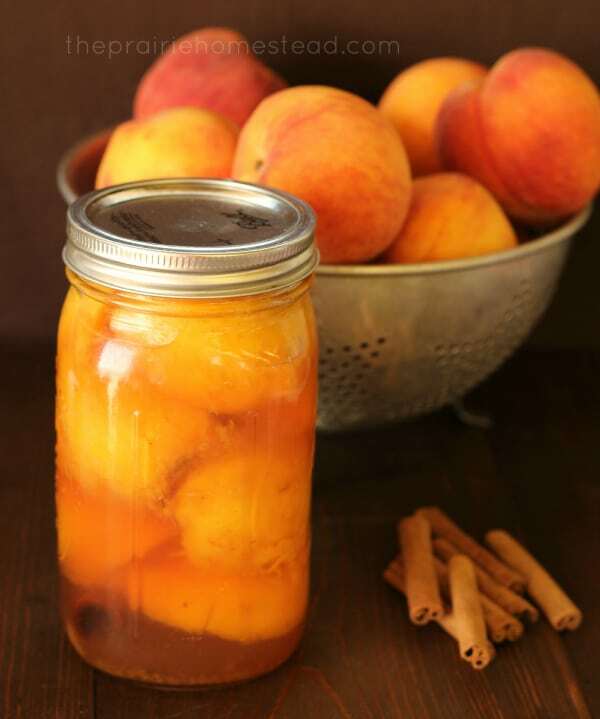 Most folks can peaches or pears in either a light or heavy sugar syrup, but this is done for flavoring purposes only, and it has no bearing on the safety of the process. You could actually can peaches in plain water, if you wanted too. The peaches I had waiting on my kitchen table were plenty sweet enough, so I settled on a very lightly-sweetened honey syrup for my canned peaches. If you’ve ever had honey turn rock-hard in your jar in your cabinet (don’t you hate that?) you might find this as mind-blowing as I do… This one particular honey, tupelo honey, is harvested by a sweet family in Florida (see what I did there? ), only when the tupelo tree is in bloom. And it will NEVER crystalize, not on your counter, not in your cabinet, and not in your canned peaches. Now that’s some amazing raw honey right there. New to canning? Check out my water-bath canning tutorial before getting started! 1. Peel the peaches. The easiest way to do this is to dunk them in boiling water for 2 minutes, and then immediately dump them in ice cold water. The skins will come right off. SO much easier than using a knife, and less waste, too. 2. While you are working on your peaches, bring the 9 cups of water, and 1 cup of honey to a boil in a medium saucepan. 3. Remove the pits from the peaches, then halve or quarter them. You could even cut them into small slices, but I like to just cut them in half since it takes less time. 4. Place 1 cinnamon stick in the bottom of each sterilized quart jar. 6. Fill the jar the rest of the way full with the hot honey-water solution. Leave 1/2″ headspace. 7. Adjust lids and process quart jars in a hot water-bath canner for 30 minutes. To get the rest of the details about the canning process (like how to properly tighten lids, and how to determine headspace), read my water bath canning tutorial. Not in the mood to can? Check out my Honey Roasted Peach Recipe-– it’s a light dessert that’s perfect for company! Here’s how to make peach butter, if that is more your style. Or just whip up some peach pie filling for the freezer, and skip turning on the oven altogether! The peeling method I mentioned works the best if your peaches are nice and ripe– not necessarily mushy, but definitely soft. You can use pint jars if you like– just process them for 20 minutes instead. As written, this is a very lightly sweetened syrup. Feel free to taste it before you pour it into the jars, and add more honey if you like it sweeter. Don’t like cinnamon? Simply omit the sticks for basic honey peaches. A lot of folks add lemon juice or citric acid to their peaches to prevent browning. I didn’t, and I still think the color is ok. Even if they were a bit brownish, it wouldn’t bother me I guess. This little recipe most definitely did NOT disappoint! I can’t wait to enjoy these all winter long on oatmeal, ice cream, and just because. Peel the peaches. The easiest way to do this is to dunk them in boiling water for 2 minutes, and then immediately dump them in ice cold water. The skins will come right off. SO much easier than using a knife, and less waste, too. 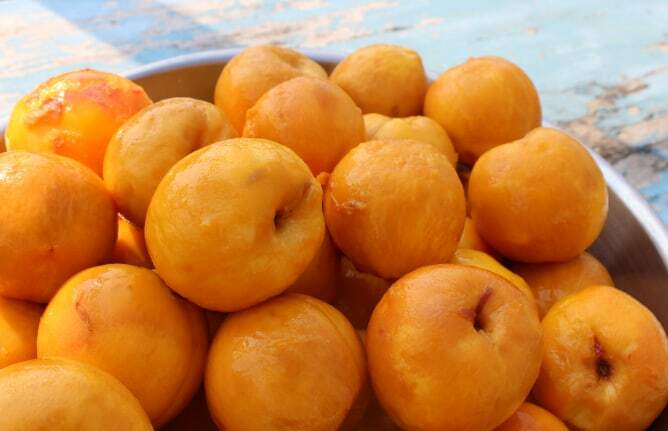 While you are working on your peaches, bring the 9 cups of water, and 1 cup of honey to a boil in a medium saucepan. Remove the pits from the peaches, then halve or quarter them. You could even cut them into small slices, but I like to just cut them in half since it takes less time. Place 1 cinnamon stick in the bottom of each sterilized quart jar. Fill the jar the rest of the way full with the hot honey-water solution. Leave 1/2″ headspace. Adjust lids and process quart jars in a hot water-bath canner for 30 minutes. In the thick of canning season? Check out my Six Tips for No-Stress Canning! Your peaches look yummy! I’m canning my second round of peaches today. Yesterday I made a light honey syrup for the first time and today I’ll add the cinnamon sticks, too. Thanks for sharing your recipe and your beautiful photos! 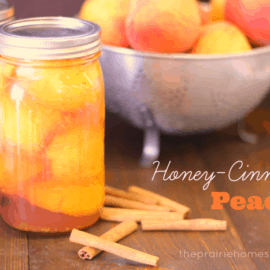 Can i use gr cinnamon instead of stick cinnamon in my canned peaches? Living in the south, I struggled with the heat in the kitchen issue when canning also, but not anymore. One day, I will have my outside kitchen but for now we use a simple propane fish/turkey cooker outside for all our canning and jelly needs, it took a little practice regulating the flame to not over pressurize, but it is so worth it. We looked around and found a sturdy model that could hold the weight of our full canner and it has more than paid for itself, since I do not have to aircondition the house from the heat of canning and can everything without the dread of the heat build up in the house. Hey– I like the side burner idea– my grill has one of those, but I’ve never even thought to use it! I can tomatoes, green chilies, and diced onion all the time…It’s just like Rotel! I also can outside on a propane cast iron double burner thingy…Have for the last few years. Makes a great difference, especially when canning Tuna! No fishy smell in the house! This is the gas grill unit we got. It has great reviews for pressure canning on it! I was wondering if I could use my stevia as well as honey? Those peaches look amazing. Peaches were the very first thing I canned as a young 20-something several years ago and I was immediately bitten by the canning bug. 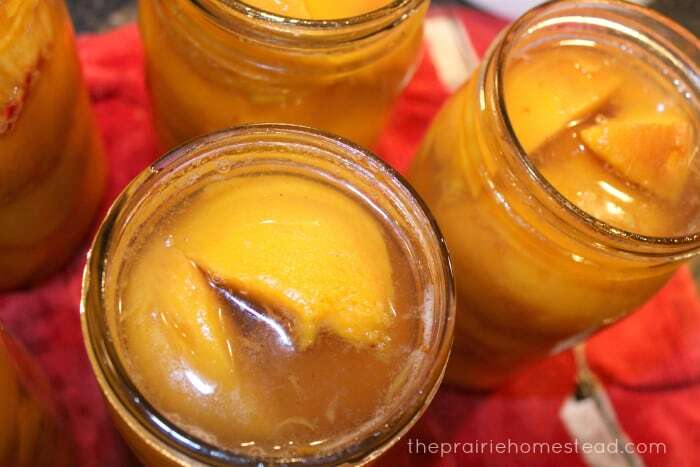 I’d love to run a canner full of them again, there’s nothing quite like the taste of home-canned peaches. They make an awesome summer-time snack fresh out of the chilled jar. Thanks for sharing your recipe. 1. Why pit side down? I would think it would lead to trapped air bubbles!?!? 2. I purchased an outdoor burner this summer. LOVE IT!! All the heat is outside the house and it is Super Fast boiling water. My canner is boiling in 7-10 minutes. My stove top inside takes 20+ minutes to boil. I find myself constantly running outside to cook something instead of waiting on our stove. Corn, potatoes, you name it. Since we have a covered porch, I have even canned in the rain. Pit-side down helps to conserve space- or at least that is what my Ball Blue Book says- ha! I actually borrowed my neighbors burner yesterday to do some canning, and I fell in LOVE with it! SO much better than doing it inside- I will definitely be looking for one at garage sales! Just some thoughts/ ideas I thought I would share. I have always enjoyed canning. It’s also been a tradition passed down our family for years now-even my great-grandma canned. One thing my Mom started doing years ago was to can in apple juice. Also to add 1/4 tsp lemon juice concentrate to each jar of fruit to preserve color. When I got married I thought I would try making my jars without sugar (my Mom always still added a little sugar) and we think they taste better than with sugar because you can taste the fruit so well. I use the No Sugar added pectin pkgs. I’m new to canning. (as in very interested but haven’t taken the leap…) I’ve gone to a couple canning classes and plan to purchase the supplies soon. This recipe looks delicious! Thanks for sharing! Here is a photo of the difference. When you google the stock photo of cinnamon, 18 of the first 21 responses show cassia bark. It is the biggest common fraud in spices since the great saffron scandal. Wow– very interesting… Can’t believe they are allowed to label it incorrectly like that. Incredible! Quick question- made a batch yesterday and had to eat some today to try them- very tasty syrup but kids and I all agreed- the peaches were “fizzy” as the girls put it. Did I do something wrong? I am tempted to open the others to see if they are all “fizzy”. Could I do a hot water bath to re seal them (using new lids) if I did that? Oh wow– never had that happen before! When you say “fizzy,” are you just meaning that there are a few air bubbles, or it is tasting/feeling carbonated? A few non-active air bubbles are fine, but it if seems “carbonated,” it sounds like the fruit might have started to ferment. 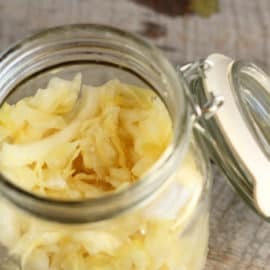 Now, fermented food can be good for you if that is what you are after, but not real comfortable with it as a product of canning! 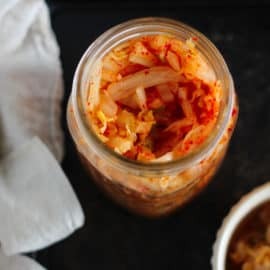 the only way it *should* have been able to ferment after the water bath canning process is if the jars weren’t probably sealed or the temp didn’t get hot enough for long enough. Yeah it was like a fermented type fizzy, they could ferment over night? Wow- guess I better pop the rest open and check?!? Can I re-can them if they are not “fizzy”? Don’t re-can them, or they’ll turn to mush! I actually only process peaches for 20 minutes, and although I plan on using about a tbsp of honey per quart jar this year, I’ve only ever used about that much sugar per jar, too. Nothing like many of the canning recipes you find. You also don’t need to boil your syrup on the stove first. I just skip that step and put the sugar/honey right into the jar and fill it with water. It’s going to boil in the canner for 20 minutes, so I’ve never understood the point of boiling the syrup first! My question is concerning the use of honey. Are you using honey as a sweetener only? If you boil the honey you kill the enzymes in the honey and make it in effect…sweetener! They look lovely and I bet taste just “peachy”. I am a beekeeper and love raw honey. I have citric acid that I found and I’d like to try that to keep the pretty color of Sun Ryan peaches I plan on buying this weekend. How much should I use per pint and quart? Hmmm… I don’t use citric acid for canning much, so I’m not totally sure. Sorry! I use citric acid or lemon juice only during the prep stage, not in each jar. The trick to preserving the color is to work quickly. No matter what type of treatment you use, the longer peaches sit, the more they are likely to oxidize and discolor. When I’m peeling peaches, the peeled peaches go into cool water with either lemon juice or citric acid. I use roughly two tablespoons of lemon juice or a teaspoon of citric acid per 2 quarts water. Again, the faster you can get those peeled peaches in the jars and processed, the better the color. If GMOs are of concern, buy organic citric acid, since it is made from corn, not citrus. I tried these today, and they look and smell amazing! I have a question, though, I hope you can help me out with. I don’t think I got enough of the air out… I can *see* the bubbles when I tilt the jars, and they clearly boiled over; the jars are all sticky. Is that okay? All the lids sealed, but I’m concerned they might go bad. What do you think? I do this except I use pure apple juice instead of honey/water. Haven’t tried the cinnamon. My problem was the peaches floated to the top of the jar, and left the liquid in the bottom. As for sealing peaches, wiping the mouth of the jar like a person with OCD can make a big difference. Also leave a half inch space from the top of the jar. If you want your peaches not to turn brown you need absorbic acid, (Vitamin C) not citric acid. Citric acid increases acidity but won’t stop peaches from turning brown. And when you process the jars, make sure you have two inches of water above the jars. Bring to a full boil, and keep it there for 20 minutes. 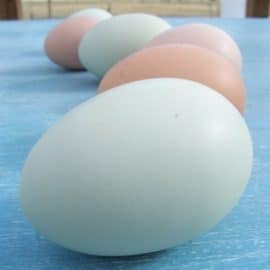 Turn the heat off and let them sit until boiling stops. Take the lid off, and wait another 10 minutes before removing the jars. Removing them too soon can cause sealing issues. 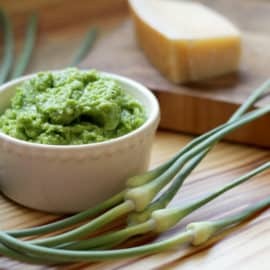 I am wondering if I can use my pressure canner instead of a hot water bath with these? Thanks for your thoughts. Is there a way I could use my pressure canner as a hot water bath canner (i.e. not seal it) ? Yes, it’s just fine to use a pressure canner as a water bath canner, and sometimes more convenient. For instance, with quart jars, my large pressure canner leaves me plenty of room for two inches of water above the jars where my water bath canning is filled to the brim. Just don’t seal the canner tightly. As Jill noted, there may be instructions in your owner’s manual. Do I need to adjust the processing time from 25 minutes due to altitude? I broke down and bought a water bath canner, followed this recipe and added 1 minute per 1000 feet above sea level (I live at almost 8000 feet and so processed for 33 minutes)–they are a bit mushy/overcooked. Thank you for your help!! A hot water bath canner is a basically a deep pot with a rack in the bottom that is filled with boiling water. You could use a large stock pot, as long as you don’t let the jars sit directly on the bottom of the pot. Some people do this by placing a towel in the bottom of the pot. Another option is to make a trivet of canning rings to keep the jars off the bottom. I hope you are saving those pits and skins for peach pit jelly! My grandma always made it, and it has the most beautiful color when canned. Please explain how to make jelly with pits and skins. Why on earth would you use pits for anything? Peach Pit Jelly is delicious! You simply cover the pits and peelings with water and simmer like other fruits to extract the juice. 20 minutes or so. Then strain the juice. Measure how much juice you end up with and proceed with your usual sweetener/pectin blend ratio for jelly. Process in water bath. There you go! These sound so yummy! I was wondering if you have tried using pears in place of the peaches? And If I want to try using pears instead of peaches would it change the procedure? You could absolutely use pears instead– the process should be the same. Just a quick note – although you can safely can fruit in just plain water, the sugar syrup does serve a purpose. Sugar binds with free water in the peaches, making them firmer and slowing down discoloration. This is why discount food stores commonly have only fruit in heavy syrup – longer shelf life, and prettier appearance after said shelf life. The Natural Canning Resource Book (http://commonsensehome.com/natural-canning-resource-book/) does a great job of explaining all the chemistry behind safe canning, and adapting recipes to use natural sweeteners and low or no sugar. Learned to can with my Granny when I was a very young girl. She used a fire pit in the yard, built with concrete blocks. Then we put the wash tub on the blocks and added water. Put the jars in & covered with tin. I have used this method in the back yard, neighbors thought I was Granny Clampett!! I used to can over a hundred quarts of tomatoes and this sure makes it quick! All you ladies that are so good at this canning. I have a ?, I am so worried about getting something in the jars ( like bugs or dust and things that are floating around outside ) that I’m afraid to do the canning outdoors. Am I being to paranoid? How long will these peaches be good for? I know for jams I have a year. Do you know about how many quarts of peaches this recipe will make? I want to make sure that I have enough honey. 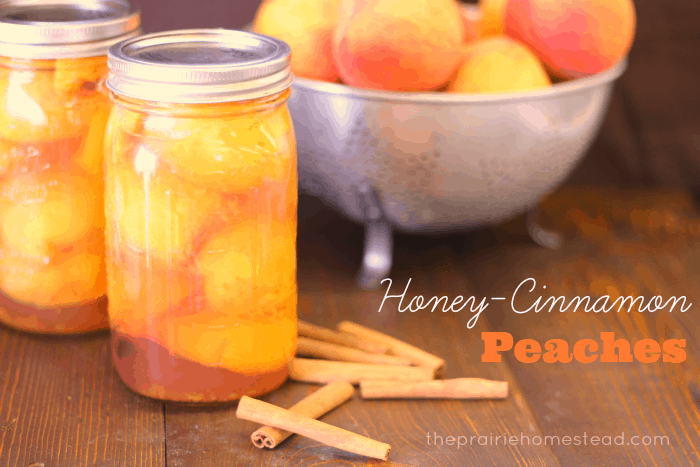 Canning honey cinnamon peaches with your recipe thank you for sharing! They look good! What is the shelf life for canned peaches? I made these last year and they were absolutely wonderful during the winter—a jar of summer sunshine when we most needed it. Thank you! Hi, I love the taste of the honey/cinnamon, and using less sugar. But let me ask a question: can you use these in recipes? I made a cobbler with them, and it seemed that the honey carmellized. Or I messed up? Would love some feedback on what you guys use the peaches done like this for. Thank you!! I tried this method today for my first attempt at canning any kind of fruit. My jars all sealed but all my fruit floated to the top leaving between 2-3 inches of honey water at the bottom and fruit outside of the water at the top. I’m reading that they should be safe to eat , but will likely discolor. I usually like to give away some final product but probably will not gift these embarrassing jars. How can I prevent this in the future?